Da Capo Lifelong Books, 9781569243145, 288pp. 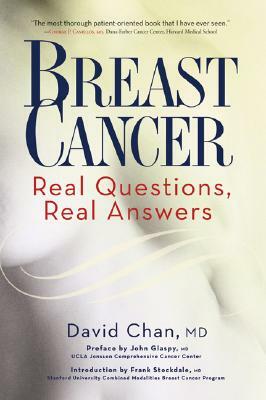 Breast Cancer: Real Questions, Real Answers is an outgrowth of Dr. David Chan's more than 20 years in private oncology practice. Inspired by his patientswho courageously face their illness but often feel fearful, confused about their options, and full of questionsDr. Chan's book is uniquely structured as a Question and Answer between patient and doctor. It provides readers with an easily navigated, completely current resource for all of their queries. Poised to become the new must-read for breast cancer patients, this book offers easily digestible information by reviewing and exploring the causes of breast cancer, outlining the core basics of breast cancer therapy, explaining how breast cancer survival is influenced by lifestyle, and much more. Dr. Chan's surefooted, compassionate tone offers reassurance throughout, as do the stories of his many patients, which give readers a firsthand glimpse at what they may face down the road, all from a survivor's point of view. Complete with a glossary of important terms and an appendix of useful resources, Breast Cancer: Real Questions, Real Answers is a must for every breast cancer patient seeking information that will guide her through her struggle toward a triumphant recovery.